Like all really nice people, you have a weakness for detective stories, and feel that there are not enough of them. So, after all that you have done for me, the least that I can do for you is to write you one. Here it is: with more gratitude and affection than I can well put down here. It would be the only detective story A.A.Milne wrote which is rather a shame as it's very entertaining. Mark Ablett, the owner of the charming country house called Red House , enjoys playing host to guests invited for golf and relaxation. One morning at breakfast he announces he has received a letter from his brother, the black sheep of the family who has been in Australia for fifteen years, informing him of his intention to visit that day. The guests leave for a day on the golf links and in the early afternoon the sound of a gunshot is heard! On to the scene strolls Antony Gillingham who has been staying in the nearby village and decided to visit his friend Bill Beverley, a guest at Red House. He finds Mark's cousin frantically banging on the locked door of the office. After gaining entry through a window they discover the body of brother Robert ........but Mark is missing. "Are you prepared to be the complete Watson?" he asked.
" Do-you-follow-me Watson; that one. Are you prepared to have quite obvious things explained to you, to ask futile questions, to give me chances of scoring off you, to make brilliant discoveries of your own two or three days after I've made them myself - all that kind of thing? Because it all helps." "My dear Tony," said Bill delightedly, " need you ask?" Antony said nothing and Bill went happily to himself, " I perceive from the strawberry-mark on your shirt-front that you had strawberries for dessert. Holmes, you astonish me, Tut, tut, you know my methods. Where is the tobacco? The tobacco is in the Persian slipper. Can I leave my practice for a week? I can." While Tony makes astute 'Holmes' like deductions Bill bounces around like an enthusiastic, overgrown schoolboy and I'm sure he must have been the prototype for Tigger. The dialogue is hilarious and the humour is very much of the era (1920s), gently poking fun at class attitudes and pretensions. 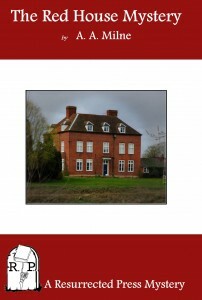 A classic country house mystery with a nice little twistat the end to stamp its own individuality on it. As Bill/Watson would say...... What fun! Jolly good fun! I love this mystery by the creator of Pooh! Glad to see you liked it too. I enjoyed every word, Bev - loving these vintage mysteries! Yes, jolly good fun. I felt like a wonderful series in the making, and I was disappointed too that Milne didn't write more crime. I love 1920s mysteries, and this sounds delightful. I'm adding it to my list, thanks. I love the vintage mysteries too and I'm sure you'll enjoy this one. I read this earlier this year and had a lot of fun with it.